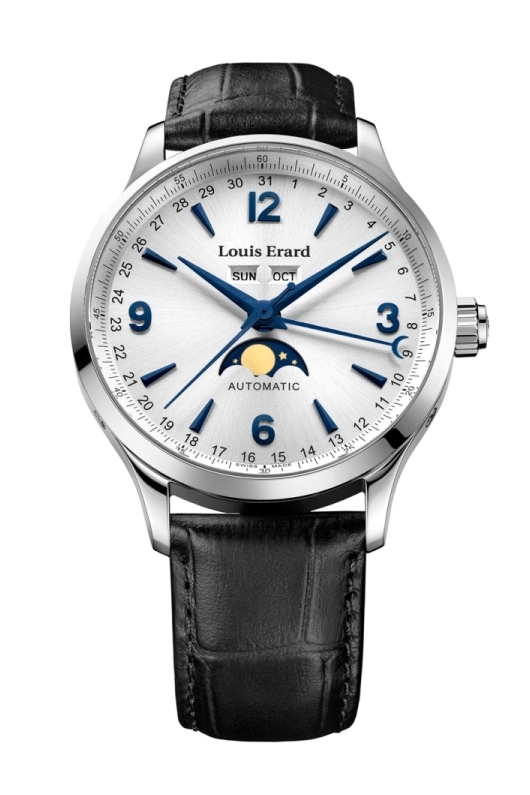 In 1931 Louis Erard and his eponymous Swiss company began making watches. Eighty years later the brand introduced its 1931 collection to pay homage to those early days. 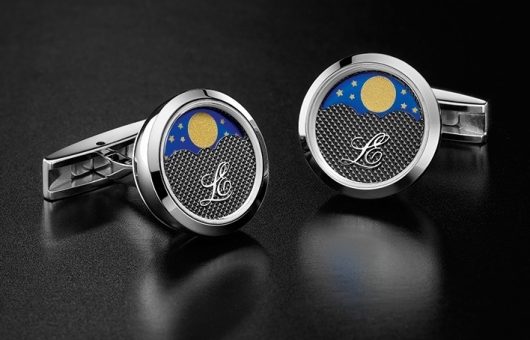 The 1931 collection includes watches that illustrate much of what was important to the brand then, and now: they balance tradition, sophistication and dependability. 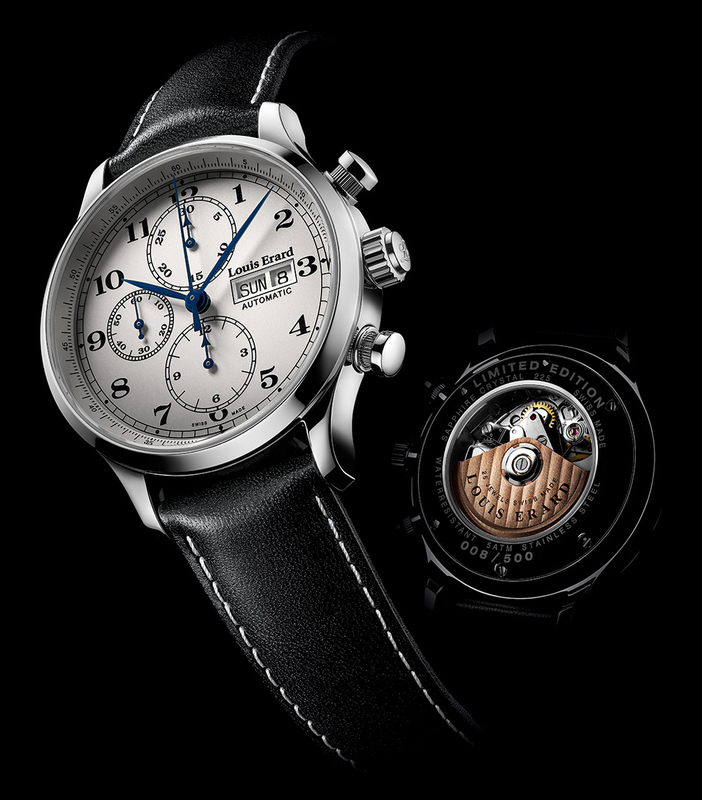 The Vintage Chronograph Reference 78 225 AA 01, a limited edition of 500 pieces, is a fine example. 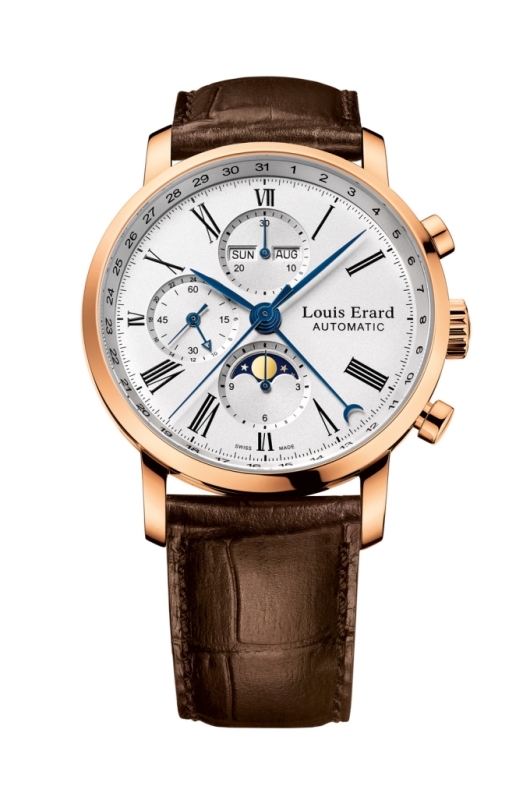 Louis Erard uses mechanical movements in its watches. 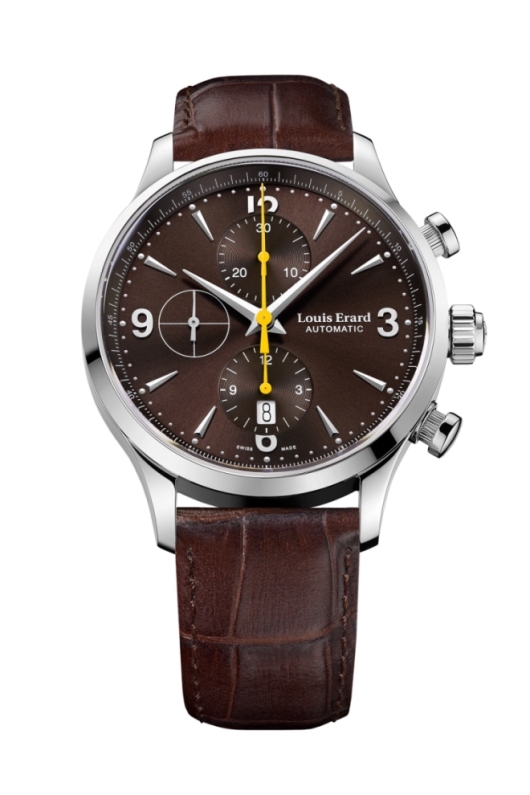 The Vintage Chronograph contains the Swiss made ETA Valjoux 7750. For anyone unfamiliar, the 25-jewel Valjoux 7750 is among the most widely used automatic chronograph movements today. It operates by way of a three-cam system (as opposed to a column wheel) and is noted for being reliable and easy to service. In addition to the chronograph function, it features a quick-set day and date. To get a glimpse of the 7750 in action, simply turn the watch over: the movement, including the customized oscillating weighted rotor with Geneva Stripes decoration, is visible through an exhibition caseback. The caseback also features the watch’s limited edition number (008/500) engraved into the case. Configuration of the sub-dials is characteristic of the 7750 movement, with 30-minute and 12-hour totalizers at 12 and 6 o’clock respectively, and a running small-seconds sub-dial at 9 o’clock. The day and date apertures appear at 3 o’clock. 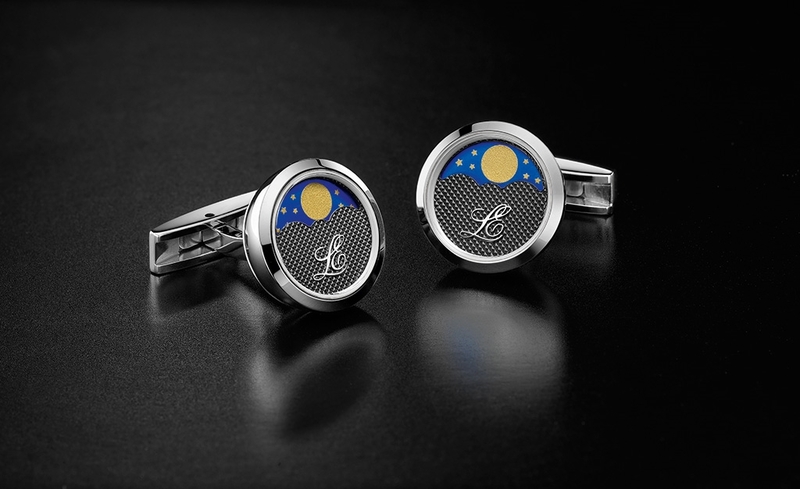 The dial itself is balanced, tasteful and well detailed. The use of railroad-track-patterned rings is both visually stimulating and useful in delineating the sub-dials; i.e., the small-seconds track has 60 indexes whereas the indexes of the chronograph sub-dials are spaced wider apart to record minute and hour increments; the dial’s outer track measures passing minutes and chronograph seconds. 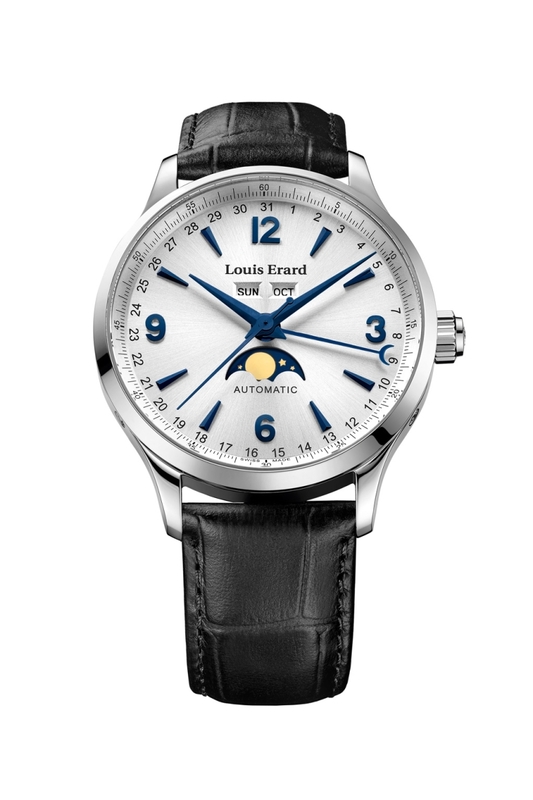 Serifed Arabic numerals, blue hands and arrowheads add strong vintage appeal. A few modern attributes indicate that this Vintage Chronograph is in fact a contemporary piece. For one, the stainless steel case is 42.5 mm in diameter (vintage watches are typically smaller), and the crystal is sapphire with anti-reflective coating on both sides. Elegances include curved and polished lugs, a polished bezel and crown, and polished caps on the chronograph pushers. The attractive black leather padded strap features cream stitching and a prong buckle. 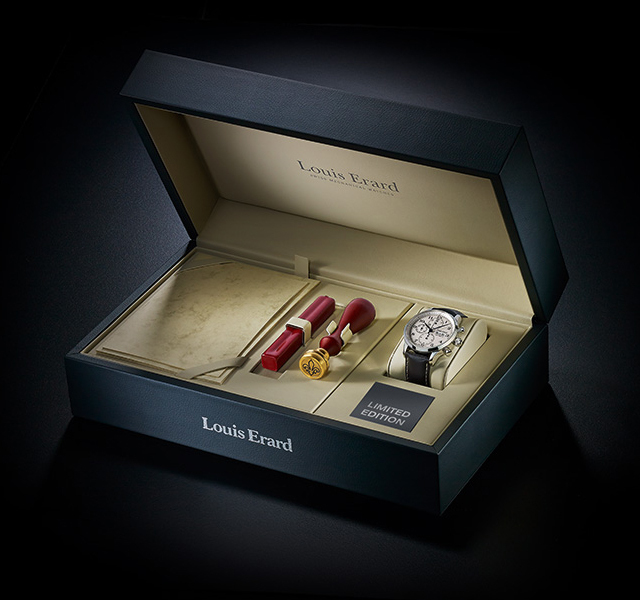 Louis Erard delivers each of the 500 Vintage Chronograph watches in a special presentation box that includes a seal, sealing wax and vintage stationery. What remains in this discussion of the Vintage Chronograph Reference 78 225 AA 01 is its cost, and the good news is that Louis Erard is committed to offering its watches at affordable prices. Even with its value-added refinements and Swiss made automatic movement, the Vintage Chronograph can be had for a lot less than you might think. 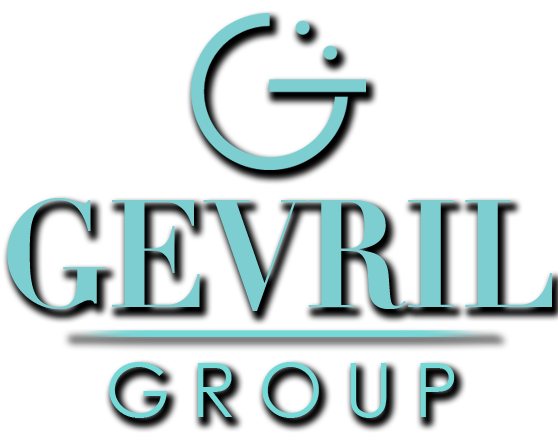 Contact an authorized dealer today to inquire.